The team came into the first San Diego round of 2016 with heads held high and holding the 450 class red plate. Knowing full well however; it was only the second round of 17 and there is a long way to go. Jason Anderson had another good day going with solid times in practice and looking stellar in red/white gear to go with his coordinated points leader plates. In his heat race, he had a decent jump off the gate and even exiting the first turn, before another rider made a mistake in front of him, costing several positions. As the race was waning he had been on the heels of the final qualifying position for a couple laps and had to make an aggressive pass to secure the position. The track was tough to pass on as qualifying times were once again within 2 seconds from 1st to 20th. Anderson did what he had to do. With the final transfer position in the heat, you are not rewarded with the best gate pick, but it's certainly better than being forced to a semi or even the LCQ. Unfortunately for Jason, he could not make the gate work and was quickly shuffled to the back of the top 10. For nearly half of the 20 lap main event, riders were bunched up mostly single fill leaving very little room to pass. Anderson methodically picked off competitors to get into a podium position by the end of the main. Then controversy ensued. A protest was filed claiming that Jason had jumped on a red cross flag. A penalty was enforced without even coming to the team to discuss. They have people filming every practice, every qualifier and every main event. In their hands they had proof that Anderson broke no rules but the penalty stood anyway, stripping him of his second consecutive podium in as many tries. The only thing to do now, is focus on next week and winning in Anaheim again. Zach Osborne is clearly a different Supercross rider in 2016. Perhaps that is in part due to having his thumb broken in the opening heat race a year ago. However; everything seems to have improved. In San Diego he was good throughout the entire event. Times were solid and he rolled to a second consecutive heat race win. In the main event Osborne started near the front and moved into the lead. Zach was out in the lead for most the race before falling to 2nd place late. In an effort to mount a charge to attempt to retake the lead, he went down and fell back to the 6th position where he crossed the finish line. Zach Osborne: "Today was a good day and I had speed all day. I won my heat race again and I was really close to winning the main event but I ended up sliding out on lap 13. I ended up with a 6th but at the same time I can't be too bummed because I was close and I think a win is in sight." Christophe Pourcel made several steps in the right direction in round 2. He maintained fast qualifying times in practice similar to the first stop, but his racing and starts were much better at night. He just missed qualifying out of his heat before making his way in through a semi. He started in the front pack in the main and battled with the top guys for several laps. Similar to his outdoor campaign he will focus on getting everything dialed and stay healthy for first few rounds and come on strong soon. Pourcel has not only had 5 years off out of the stadiums, but he is also a rookie to the 450 class in SX. Christophe Pourcel: "Today was a decent day. I had a pretty good practice and it's good to know I have the speed again for the second week. I had a good start tonight and I think I learned a lot from that, riding with the top guys. I'm almost at the right speed but I just need to get more aggressive. For these first few races I'm here to learn. After 5 races we will have 12 rounds to go. The speed is there, it's just been 5 years since I've raced Supercross. With motocross it wasn't as bad because I had still been racing it. 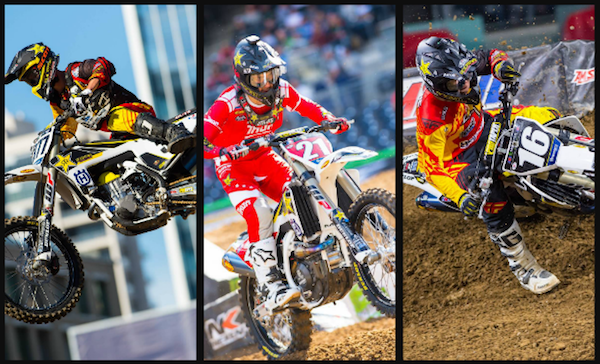 I think after 5 years off it's good to still have the speed in Supercross and we will put it all together soon." The team will file an appeal in hopes that they have enough proof to overturn the decision and regain the points Anderson deserves. He will put the situation behind him and go for another win. Osborne has much positivity to take away from the past two weeks and is eager to get his first career win. Pourcel will continue to study and test to get closer to the top 5.